Here at Flyte so Fancy we have built hen houses for small flocks. We've designed and built hen houses for half a dozen hens and the full dozen. We've made houses suitable for a couple of ducks on the pond and we've made a Floating Duck Lodge suitable for a community of eight ducks to float in leisure. What happens though when you look around and the five hens you started with has suddenly morphed into a flock of fifteen or more and your wondering where to keep them? The answer is of course a bigger hen house and Flyte so Fancy have a range of larger hen houses, with unique features, that make keeping a large flock of hens a stylish yet easy proposition. A large, practical house, the Handy 15 Hen House comes with built in handles and wheels to make it easy to move. Built with room to house fifteen hens, the external nest box provides plenty of room to roost on its full length perches. Double ventilation louvres keeps the inside of the hen house light and breezy and the removable resin-coated board roof and the large front door make access and cleaning quick and simple. A functional, mobile coop, this larger hen house has a floor space of approximately 5ft by 3ft is ideal for people with a large paddock or field and looking to move their hens to fresh pastures. 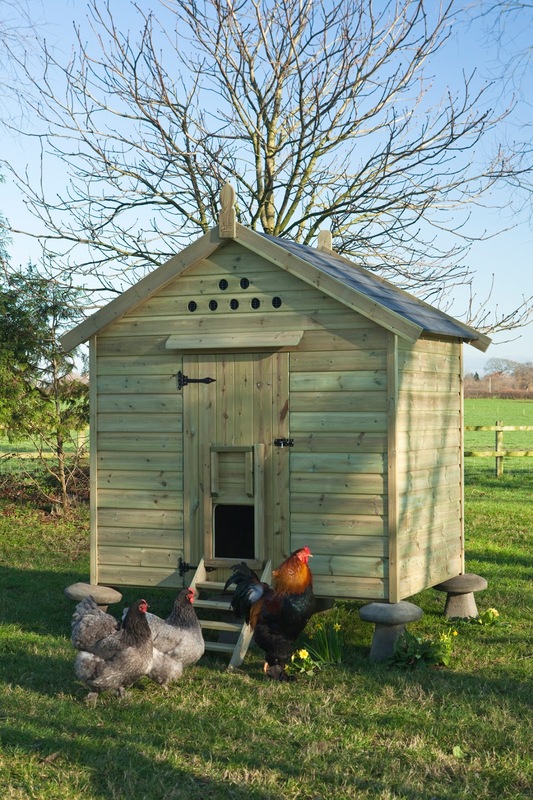 Our most popular hen houses's big sister, the Maggie's 24 Hen House is a large traditional style chicken house with plenty of room for approximately twenty four laying hens. With its external nest box the floor space for perching inside this hen house is approximately 5ft by 4ft. The Maggie's 24 Hen House has raked perches inside to provide plenty of sleeping space for larger flocks of chickens. A larger hen house, the Maggie's 24 has several features to make it easy to maintain. A removable dirt tray and large back door make cleaning easy, with plenty of access into the coop. Should you feel like really getting stuck in, the removable nest box opens up a complete side of the hen house, allowing unlimited access. The Maggie's 24 Hen House is ideal for back gardens where the passion for poultry has gotten a little out of hand. 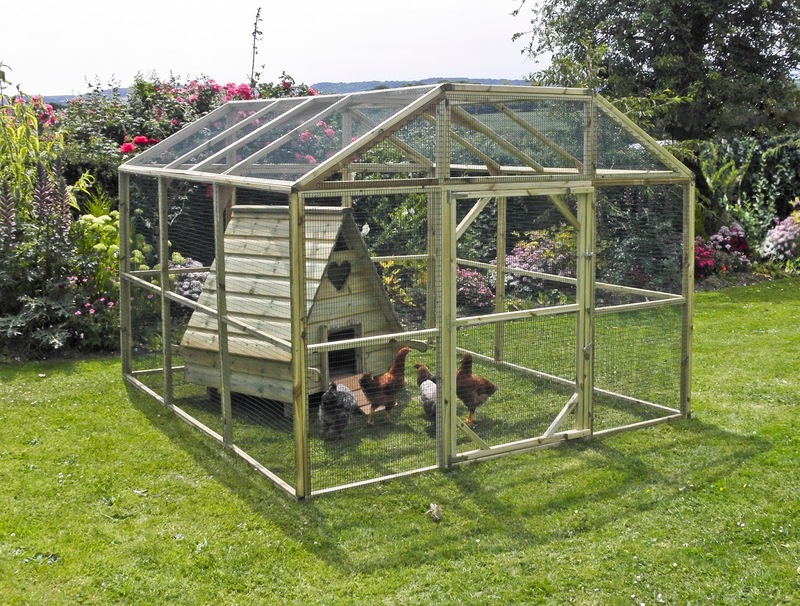 A large, grand hen house with space for up to thirty hens to stretch their wings in luxury. Standing high upon its imperious staddle stones, the Granary 6ft Hen House is a mansion for the largest of back garden flocks. With three internal perches and an external nest box, the floor space measures approximately 6ft wide by 4ft deep. A large hen house with a rustic charm, the Granary is big enough to hold the largest of flocks and is ideal for when you realise you know have 20 more hens than you ever thought about keeping to begin with. If you have any questions about our larger hen houses for larger flocks of birds, you can leave a comment below, or call us on 01300 345229 to talk to a member of the FSF Team. Here at FSF HQ we get phone calls everyday from people with questions about chickens but, in particular our hen houses; what are they made from, are they sturdy and most importantly will they keep predators out? 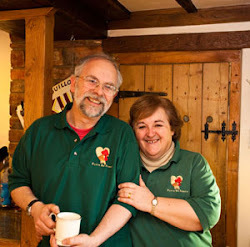 Often while typing has the muse descended on the Flyte so Fancy Blog and we have written pages about our hen houses aesthetic charms, the joys of keeping chickens, the numerous advantages of eggs for cakes and breakfast, as well the quality and strength of our British made timber hen houses. So we thought we'd write something a little more industrial and scientific, highlighting the high quality of materials used in our hen houses and runs, and just why the materials Flyte so Fancy use make them the strong predator proof houses they are. A hen house is only as good as its first line of defence, the run. Chicken wire simply will not cut the mustard in keeping foxes, badgers or anything else out. It is too weak to prevent a predator breaking through. 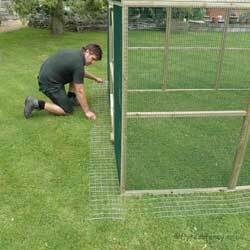 All of our Chicken Runs and Poultry Protection Pens are made out of 38mm x 38mm framework. Onto this durable lightweight frame is stapled European plastic-coated heavy 18 gauge weldmesh. This incredibly strong weldmesh requires wire cutters to cut it, so there is no chance of foxes, badgers or any other predators breaking through it. Truly predator proof chicken runs. With your chickens safe in their run from predators (unless they brought their tool kit), the second line of defence is to prevent any predators from digging in. A 10 inch wide strip of 2" x 2" weldmesh, that is held in place on the ground by 13 inch galvanised pegs. Foxes, the usual culprit, like to burrow up against the fence, wall, etc, to make the smallest tunnel they can for the least effort. The No-Dig Skirt prevents them doing this, and rather than expending greater levels of energy, the fox will move off to find an easier dinner. No Dig Skirts are an economical but highly efficient way to stop foxes digging in and can be cut in our workshop to match any run size. All the bolts, hinges, chains, and turn buttons on our hen houses are smelter galvanised, meaning they have been hot dipped in molten zinc. Not only strong and secure, keeping your girls safe at night, this top of the range galvanising technique makes them durable for well over a decade. The bolts and turn buttons on our hen house will stop any predator from breaking in, providing safe, sleep filled nights for your hens. If you have any more questions about Flyte so Fancy Hen Houses and why they are so well built to prevent all and any predators from getting to your hens you can leave a comment below, or call us on 01300 345229.